Are you hooked on decorative solar lights yet? I hope so, but if not yet, below are a few more unique ones to consider for the holidays. Still don't forget about all the other ones available online. There are many solar string lights, multicolored and not and of course the ones I've written about in the past. This cute simple statue is made to endure the outdoor elements. 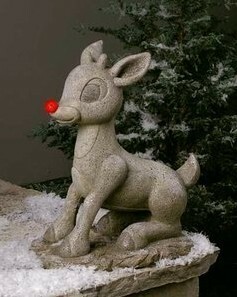 It measures 20 inches tall, has a solar panel on the bottom side of the unit (I am unclear from the picture where this is) and of course, it has the cute little red nose that lights up the way. 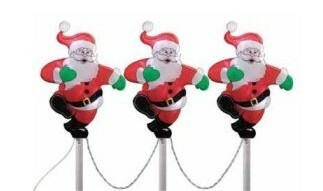 This solar decoration has 3 jolly Santas at the top of 3 white poles poll. They appear to be joyfully skipping. The decorative light contains 12 white LED bulbs is 18 inches tall. It also has a 36-inch lead cord and 4 inches in spacing. The light, according to the description, can be used outdoors as well as indoor. 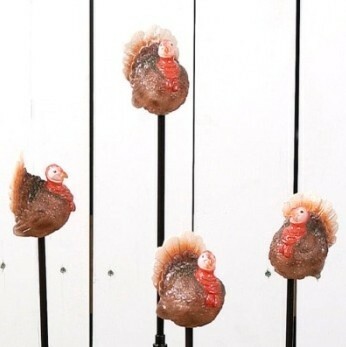 It may be too late to order these for the Thanksgiving holidays but who says the rest of the season can't be powered up with these 4 golden solar turkeys (or 4 pumpkin) toppers? The unit is fully waterproof and weatherproof. The lights also charges by day and emit a low yellow light at night. This pretty glass light unit includes 1 stake and 3 interchangeable solar finials: snowman, angel and tree.The solar panel and the battery pack are built into the steel stake. The NiCad battery is rechargeable and the light it emits glows for up to 12 hours. This solar powered string light with 60 lights does not require an extension cord. This means the lights can be placed anywhere. There is no need to stay close to an outlet with this one. So if you want to put it on your mail box or around a tree or even on your car (not fuel efficient) as long as the light charges up during the day it will light up at night. Choose from multicolored or plain white.